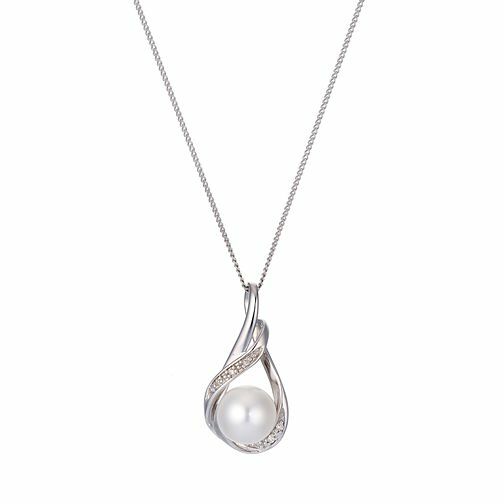 An elegant pearl drop pendant with wave design. Featuring 9ct white gold and cultured freshwater pearls and diamonds, this is a truly elegant piece of jewellery for any occasion. Classic elegance for any occasion. 9ct White Gold Cultured Freshwater Pearl Diamond Pendant is rated 4.0 out of 5 by 1. Rated 4 out of 5 by Lorenzo from Very nice product for the price I bought this item for my girlfriend and she was very pleased with it. Although the diamonds are quite small, the overall look is still appealing. My main fear was the pearls mouting may but it seems to be mounted fairly securely. The chain is fine and delicate and does with the pendant well. Overall a good item for the money.